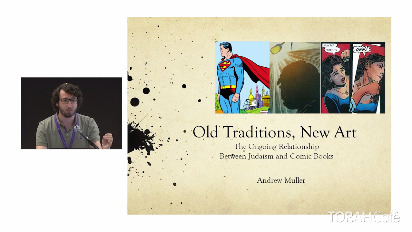 Andrew Muller presents his paper about the ongoing relationship between comic books and Judaism. He compares Moses and Superman, drawing parallels between their origin stories and the dichotomy contained in both characters. He points out Jewish themes and rituals that show up more overtly in modern comics as well. 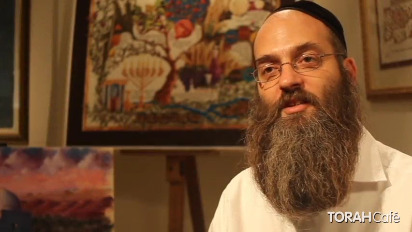 In addition to being an artist, Rabbi Moshe Braun practices safrut- Jewish Scribal Art.. In this fascinting, informative video, he takes viewers on a journey into the world of safrut. We learn about the different texts the sofer writes- Tefillin, Mezuzot, Torah Scrolls and Megillas, and Rabbi Moshe Braun shares all the little details that make up the wonderful world of Jewish scribal art. Have you ever wondered what is the role of the Ketubah in the Jewish Marriage Ceremony? Rabbi Braun explains the importance and different components of the Ketubah document. Rabbi Braun also goes through the reasons for and methods of the beautiful artwork that is found on many Ketubahs nowadays. Art is the intersection between heaven and earth, soul and body, energy and matter. Join renowned artist Moshe Braun for an exploration of the connection between the Land of Israel, G-d, and the Jewish people through his depiction of Israel's Seven Species. Michoel Muchnik has taken the brush, paint, canvas and clay and implanted within them a spiritual life force. For more information and to purchase art by Mr. Muchnik, check out muchnikarts.com.